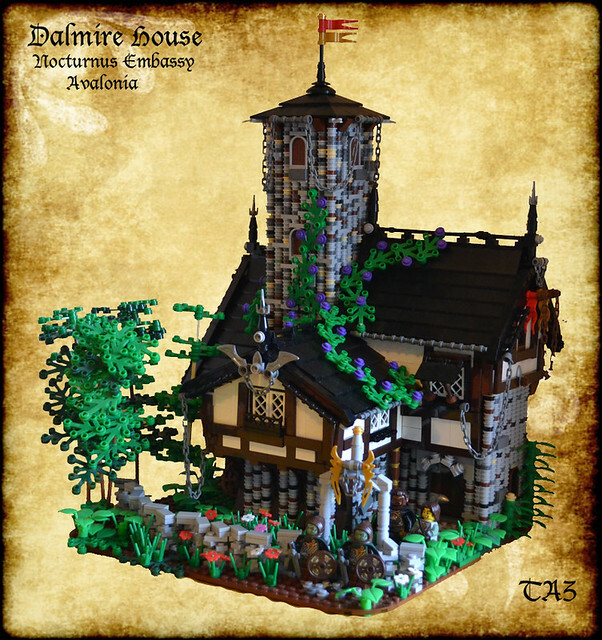 Just outside the Albion city walls lies the derelict Dalmire house, Nocturnians are not known for their green thumbs or garden maintenance. WIP pics below (a few things need fixing before I add characters, then on to Mitgardia). Please excuse the low quality photos ( my lamp exploded ). This is a beautiful MOC! I thought at first that I was looking at one of Derfel's works. This has a nice old haunted house feel to it, and I love the overgrown estate. 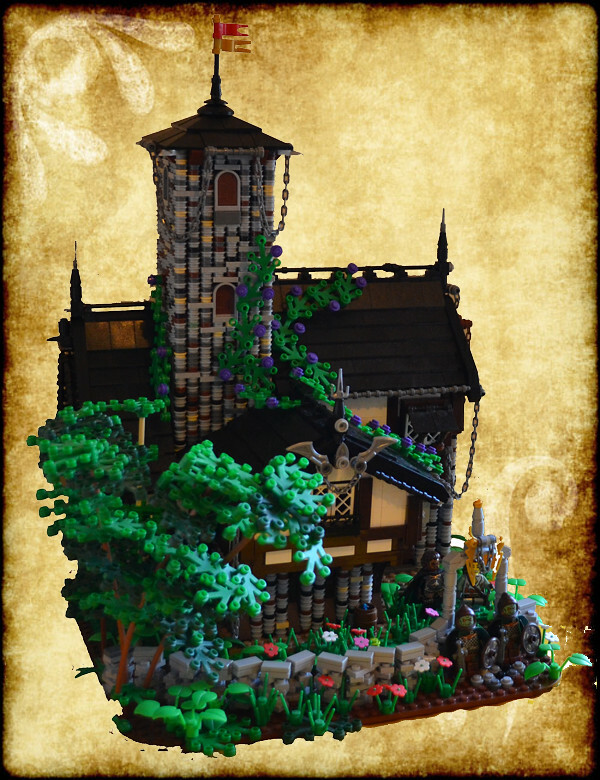 Very cool moc, I like the tower, reminds me of the Adams family house lol. Still needs a bit more Nocturnus flavour, at the moment it looks a little too Avalonian (might have something to do with the fact I've use DC's 1x1 round technique. I thought at first that I was looking at one of Derfel's works. Well that would make sense since DC is the style Avalonia is based off of. Nice landscaping, though it looks like the timber work on the half-timbere parts are missing in a few locations. Is that one of the "WIP" aspects still? I think you're right Taz, it is a bit too Avalonian still. Looking forward to seeing it finished! Wow Taz! Time to step out of the closet and say that you are an Avalonian after all! I just love the house! Great work on this one! How have you solved the arch problem over the windows in the 1x1 round brick tower? It looks so good, when I try to, there is always such a big gap between the bricks and the window. Is it the angle of the photo? From what I can see it´s only a 1x2 plate over the window? You're getting better and better at this! Looking really good so far, I really like the old haunted feel you have created here, it really gives it some charm and character. It definitely fits into Avalonia! It fits everything together. Love your Figures. @ de Gothia: Yep it's just a 1x2 plate on top of the arched window....it does look gappy at first but once it all comes together you don't notice as much. And now with that update I really have to say that it´s time to step out of the closet and admit that your heart is Avalonian! Great work and I love the foliage all over the place! Good work ol' boy. I do feel it is missing a little half-timber work in a few places, but I like how you made it not look like a boring ol' box. I think you did a good job of adding some nice "rough" details to make it a bit more Nocturnian. Love the various 'layers' on the roof and the way that you have managed to include so much greenery without overly brightening the tone of the MOC (which can be difficult given how 'bold' the colour is on most of the green leaf pieces). Excellent work! Definitely very Avalonian looking, but good all the same. Nice work! I also really like the greenery.